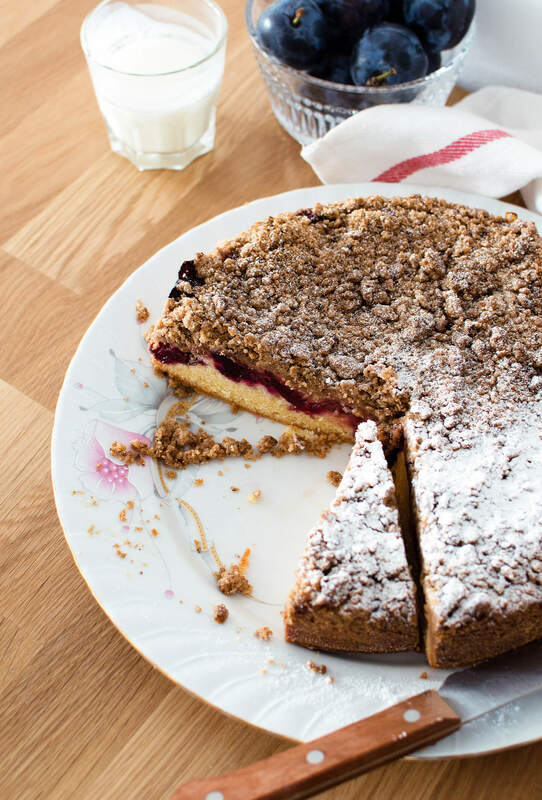 This easy plum streusel coffee cake is the perfect late summer dessert! 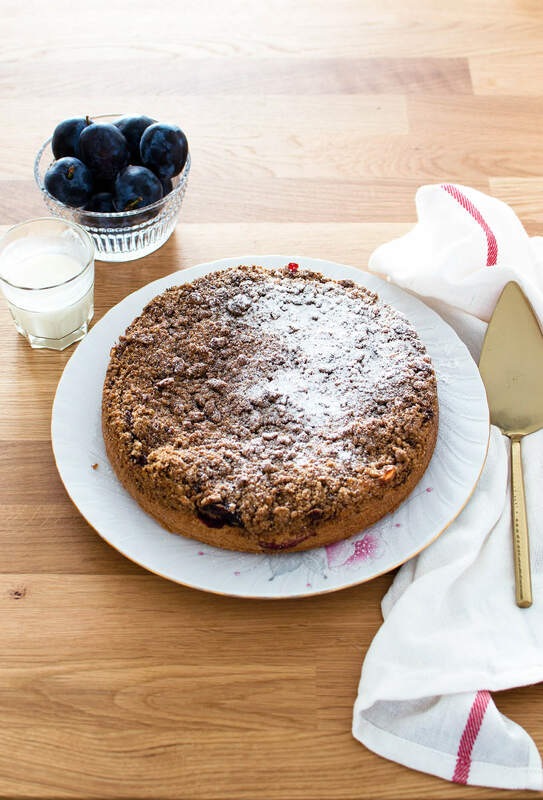 Made with purple Italian plums and buttery cinnamon streusel. I feel like I’m such a hypocrite for saying I love plums, yet I always only eat them baked in a dessert or made into a jam. I’ve never been one to really enjoy a bowl of raw plums, although I admit I do like the taste. But ripe plums really excel when cooked or baked. The wonderful fuchsia color, the intense aroma and taste are all superb in a cooked plum. 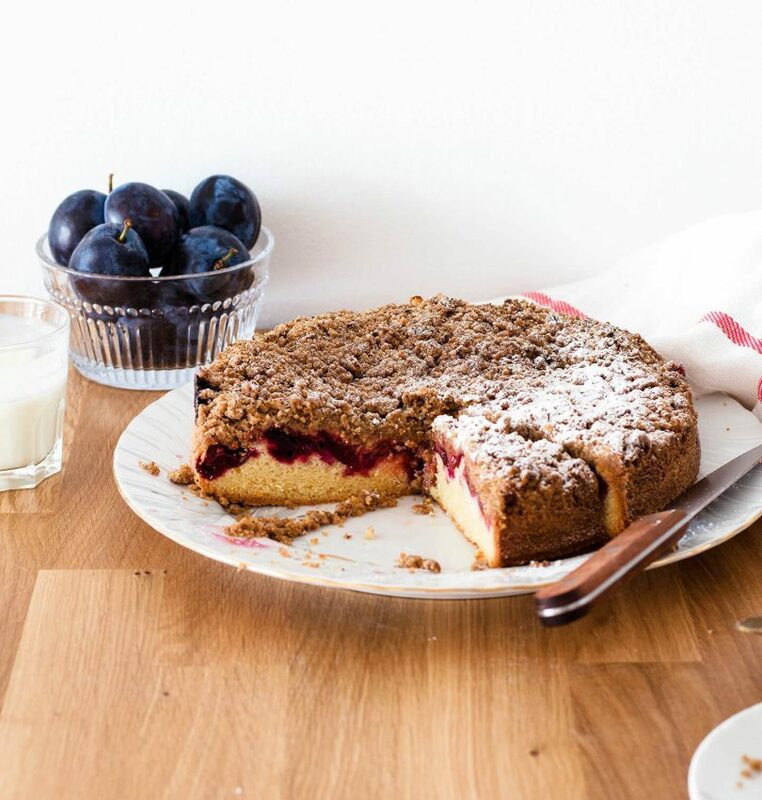 And it’s what makes this easy plum streusel coffee cake so addictive. A while back I went to the farmer’s market to look for fresh corn and I came back home with a whole bag stuffed with produce. Which, if my boyfriend were to describe me, is such an Alice thing to do. I can’t just buy fresh corn, I have to get the scallions, the tomatoes, the peas, the berries and the plums. And I don’t go to the farmer’s market a lot, so selling to me is so easy. I make an effort not to walk too close to the stands because I know I’ll be offered something and won’t be able to say no. As you can see, the plums weren’t part of my original shopping plan, but I came home with a whole bag of them. And how could I not? How stupid of me to not think of them initially. Ripe plums offer endless possibilities. 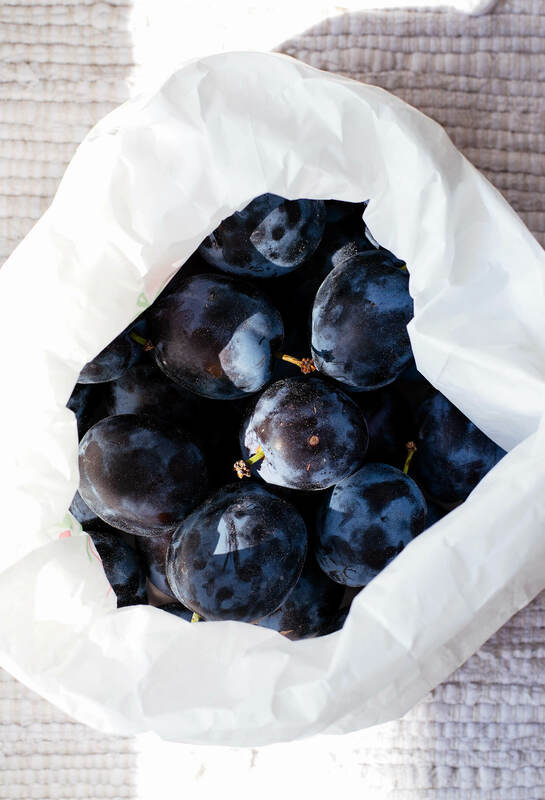 There are many varieties of plums out there, more than I know to name, but I only ever buy the deep purple blue-ish plums, apparently know as “Italian” or “Empress” or simply “European” plums. They are the kind most often grown and sold here, so they’re just the natural choice for me. I did know right away what I wanted to do with these. Make coffee cake! Nothing beats a good coffee cake, I think we can all agree on that. So in my true Alice fashion I just went online to look for plum coffee cake recipes. I think I have a plum pie recipe somewhere in our family “cookbook” (it’s just a notebook), but I wanted something more cakey and more buttery, just softer from a usual pie. I stumbled upon this recipe from Epicurious and saw that it was originally published in 1995 and THAT is what sold the recipe to me! For whatever reason, I just think that if a recipe is old or semi-old it has to be good. I did make some adjustments though, when making my easy plum streusel coffee cake. The Gourmet version has nuts in the streusel, which I’m usually all for, but not this time. I wanted this cake to taste like butter and plums and I just think that walnuts (or pecans) would take away that flavor. I also use more plums. The original recipe doesn’t specify what variety of plums you need, so maybe that’s the issue, but I just found that the recipe needs more plums to make a really packed plum cake. 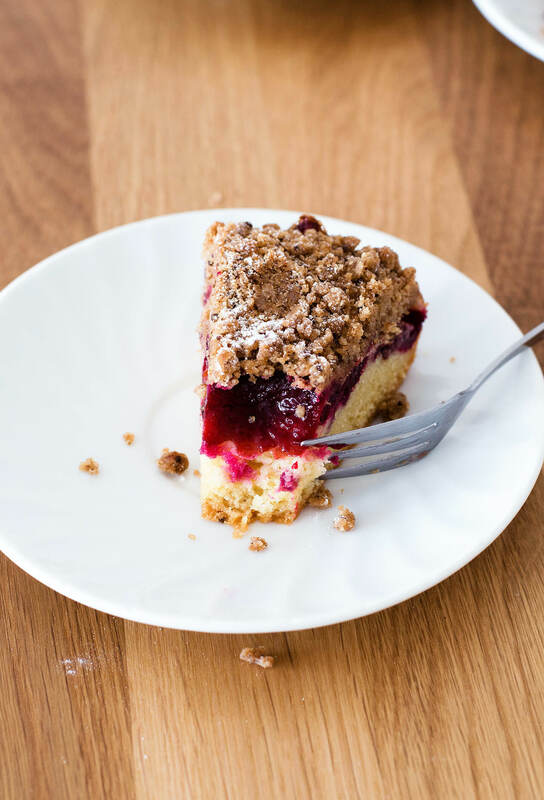 This easy plum streusel coffee cake really is easy to make, even though it’s made of three layers. 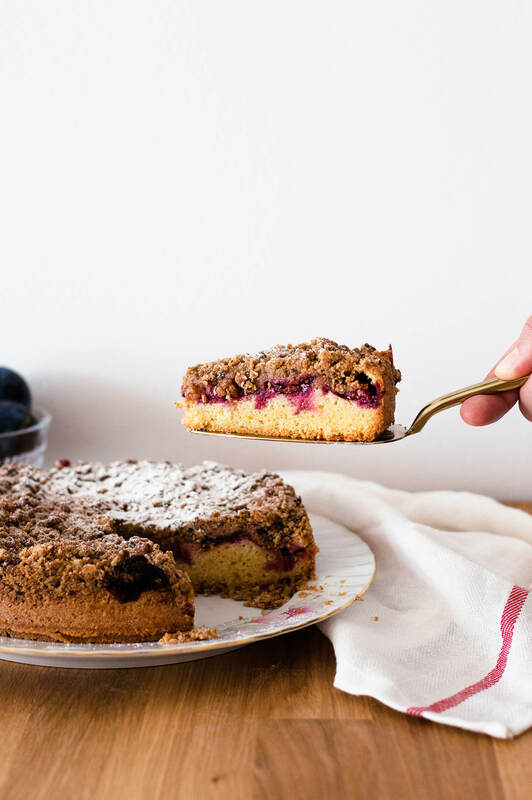 The first layer is a buttery cake, then comes a layer of juicy plums that are cooked almost into a jam and the last, top layer is a crumbly, cinnamon-packed, melt-in-your-mouth streusel. Better make this while the plums are in season! Although, if you have an abundance of plums, I recommend that you make a jam or freeze some for later. 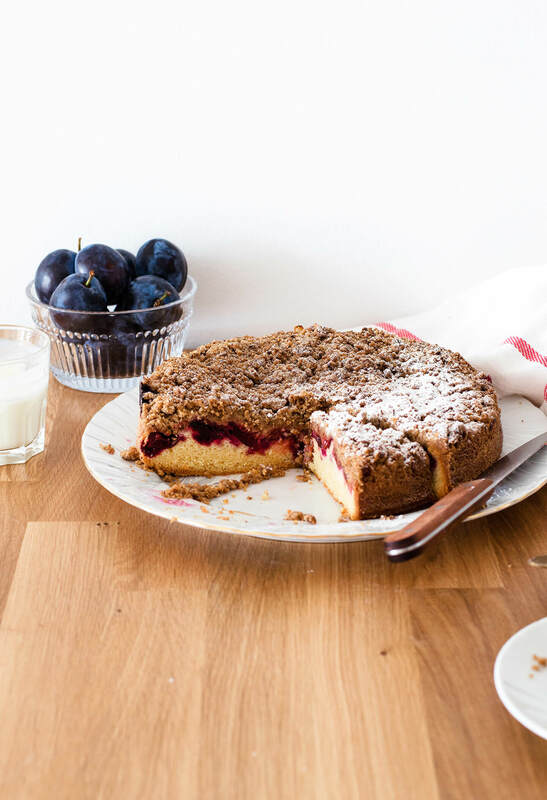 I think this coffee cake could be made with a layer of plum jam too, instead of fresh plums. And yes, I am totally doing this when Fall comes around. Perfect late summer dessert! 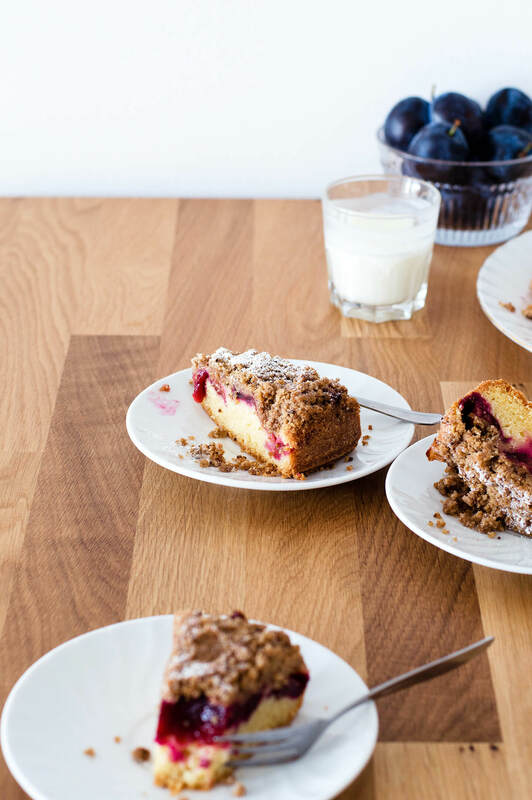 Made with purple Italian plums and buttery cinnamon streusel. Preheat oven to 180°C (350°F), with a rack in the center of the oven. Butter the bottom and sides of a 23-cm (9-inch) springform pan, line the bottom with greased parchment paper, then dust the insides of the pan with flour. Make the streusel: Place flour, sugar, cinnamon and butter in a medium bowl. Mash all ingredients together with a pastry cutter (or use a food processor) until you get a crumbly mixture. Place in the refrigerator to chill as you make the cake. Make the cake: Use either a whisk and a bowl or a mixer and beat butter and sugar until smooth and fluffy, a few minutes. Crack in the eggs one at a time, whisking after each addition. Stir in vanilla and salt. Then sift in flour and baking powder and whisk until combined. You want a smooth but thick batter. Cool cake for 30 minutes or more before removing from the pan. Dust with powdered sugar before serving. MAKE AHEAD: You can freeze the cake once it is baked. Don’t sprinkle it with powdered sugar. Instead, wrap it well once it has cooled and freeze for up to 2 months. Once you take it out, don’t thaw it. Simply reheat it frozen, in an oven set to 180°C (350°F), for 35-40 minutes. Recipe adapted from Gourmet, via Epicurious.